Get Country Life free for a week’s trial on Ipad, then rate and review it for a chance to win a three month subscription. 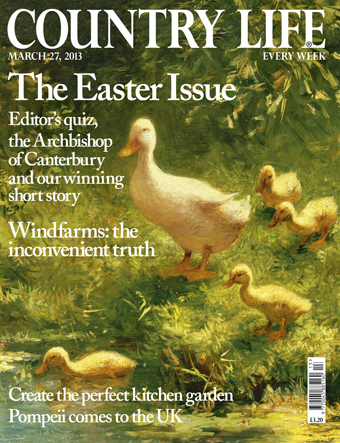 This week’s magazine is the brilliant Easter number featuring our fiendish editor’s Easter Quiz, as well as a guide to creating the perfect kitchen garden, and a good, hard look at the future of wind energy in the UK. Once you’ve downloaded your issue on Ipad, which you can do from this link or click on the cover below, please rate and review it on Itunes. As soon as you’ve done so please email holly_kirkwood@ipcmedia.com with your Itunes username and the first twenty people in the UK to do so will receive a three month digital subscription to the magazine on Ipad. Also, we are particularly looking for readers in Australia, the US and France. Please log onto the app in Itunes in your country, and rate and review, and we can arrange for a subscription on your Ipad for free, for three months to the first twenty people from each region. Just email the above address and we can set it up immediately.